Galaxy S8: How do I use my Samsung Galaxy S8 (SM-G950W) in airplane mode (or flight mode)? Unless you haven't been on a plane in a decade or so, you know airline regulations require mobile devices to be turned off or set to Airplane mode during flights. Airplane mode disables all of your device's wireless communication functions with just one touch. This includes cellular service, Bluetooth, and Wi-Fi. However, while still in Airplane mode, Wi-Fi and Bluetooth can be enabled. This is supremely important for zoning out to your favorite playlist. 3. Touch the Search icon. 4. 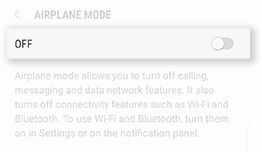 Search for and select Airplane mode. 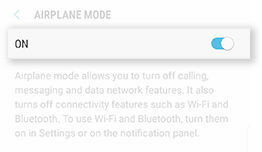 Note: Airplane mode might be called Flight mode or your device. 5. To turn on Airplane mode, touch the slider. 2. To turn on Airplane mode, touch Airplane mode. 3. Review the information and then touch TURN ON. 5. To turn off Airplane mode, touch the slider. 2. To turn off Airplane mode, touch Airplane mode.